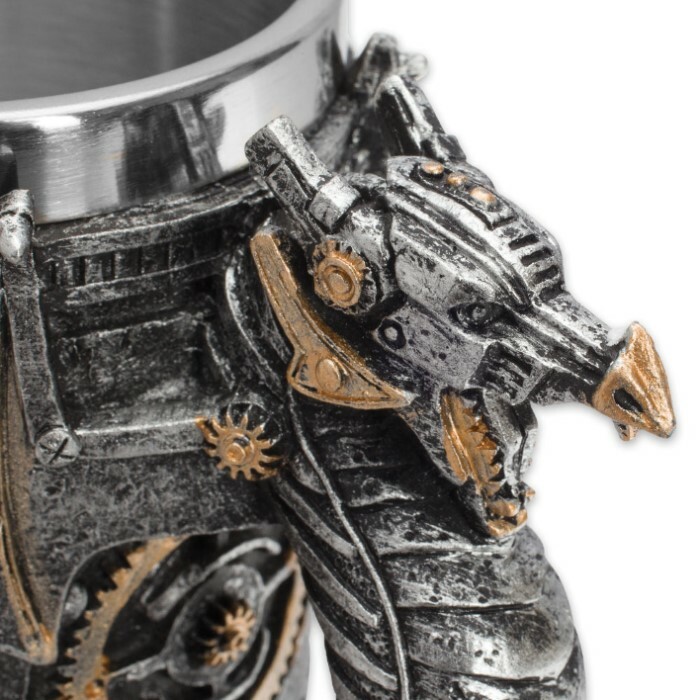 Steampunk Mechanized Winged Dragon Mug - 12-oz Capacity | BUDK.com - Knives & Swords At The Lowest Prices! 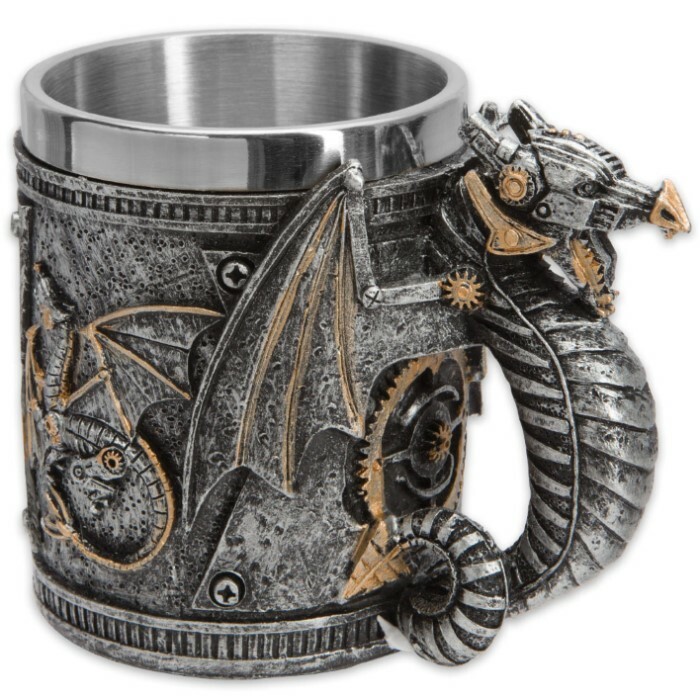 This cool mug adds a bit of distinctive steampunk flair to legendary high fantasy dragon imagery. Copper-colored gears, sprockets and flywheels cover the cup - an aesthetic nod to classic steampunk "gizmology." The handle is a beautifully detailed mechanized winged dragon adorned with gears, gadgets and other steampunk-style machinery. The cup also features a machinated dragon, rendered in striking three dimensional relief. All of the gorgeously textured ornamentation is cast tough, break-resistant polyresin, while corrosion-resistant, easy-to-clean stainless steel lines the rim and inside of the cup for added insulation. At 4 1/4" tall x 3 1/4" in diameter (not including handle), this unique mug is ideally sized and alluringly decked out for display. The cup's impressive 12-oz capacity also makes it perfect for drinking coffee, hot cocoa, tea or any other hot or cold drink! 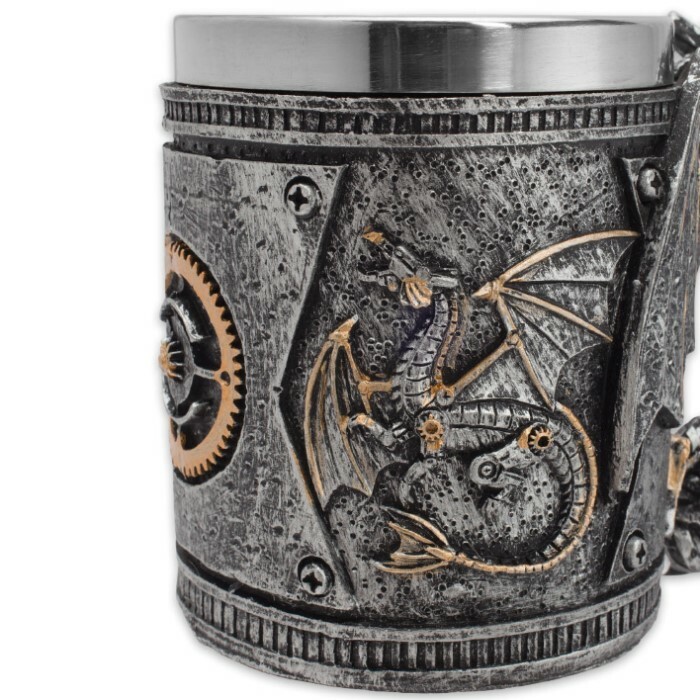 Regardless of how you use it however, the steampunk dragon mug is bound to turn heads and spark lively conversation!